Final evolution of the Rolls-Royce Cloud Series, the Cloud III was launched in late 1962. Sporting the same imposing silhouette as its predecessors, the newcomer was distinguished by quad headlamps, a lower bonnet line and correspondingly sleeker front wings. Mechanically, the model's massive cruciform-braced box-section chassis featured independent coil-and-wishbone front suspension, a hypoid-bevel rear axle, all-round drum brakes, power-assisted steering and four-speed automatic transmission. Though, to capitalise on the smaller frontal area, its 6230cc V8 engine gained more power via a carburettor modification and higher compression ratio. Thus, the Cloud III claimed both a higher top speed and better acceleration than its predecessors at 116mph and 0-60mph in 10.8 seconds respectively. Available in either standard or long wheelbase guises, the latter variant accounted for just 254 special orders. Learning Liverpool had been selected as the European Capital of Culture for 2008 gave the vendor of this particular example an inspired idea. 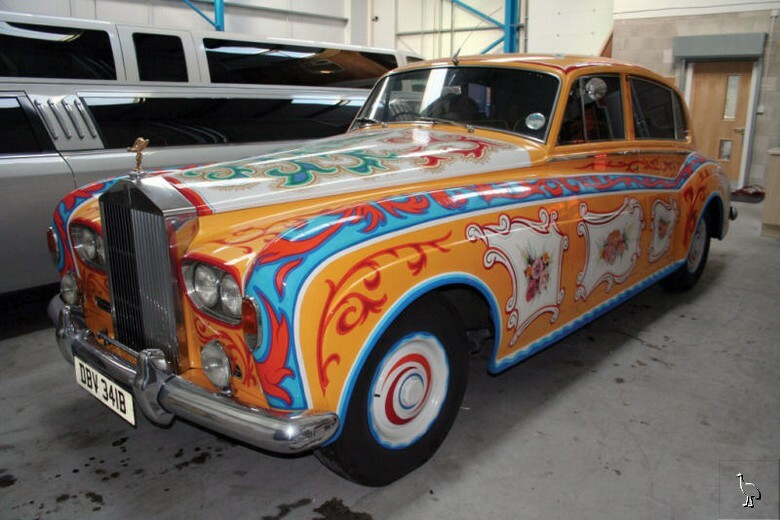 Conscious that the most famous car of one the city's best loved sons - namely John Lennon's psychedelically-hued 1965 Rolls-Royce Phantom V - was resident in British Columbia, he decided to create a look-a-like for hire and promotional purposes. To this end chassis number 'CEL45' was repatriated from France and carefully hand-painted so as to mimic both the style and finish that a Dutch team of gypsy artists known as 'The Fool' had achieved on Lennon's Phantom V some thirty-odd years earlier. Though, lacking the transformable double-bed, telephone and refrigerator found in The Beatles star's limousine, the reworked Silver Cloud III LWB's interior nevertheless boasts vibrant yellow and black leather upholstery, mini TVs and a 'starlight' ceiling. All-up the look-a-like project is reported to have cost circa £40,000, a fraction of the $2,299,000 that the real thing fetched with Sotheby's during 1985!